2. 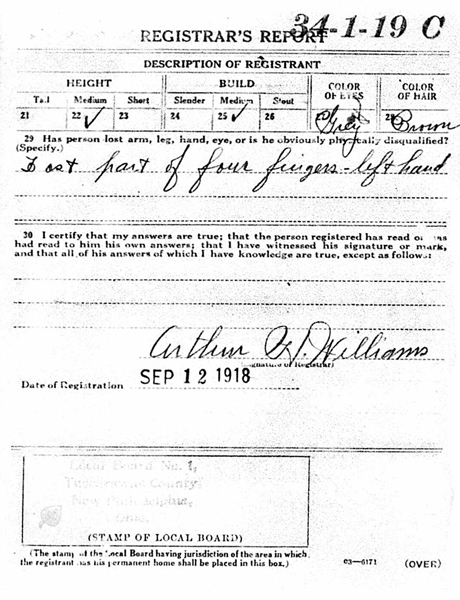 1800 U.S. Census Every-Name-Index/Images (online at Ancestry.com): Wm. 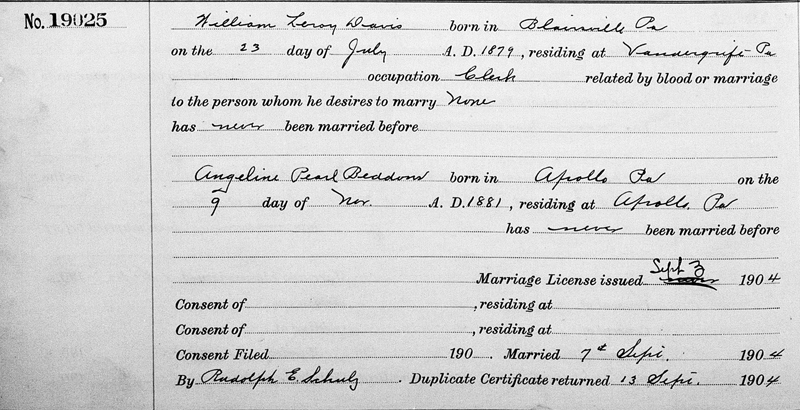 Leroy DAVIS (æ 11m, b. July, PA) is living in Blairsville, Indiana Co., PA, with his parents (q.v.). 3. 1890 U.S. Census: the 1890 Census Population Schedules were destroyed. 4. 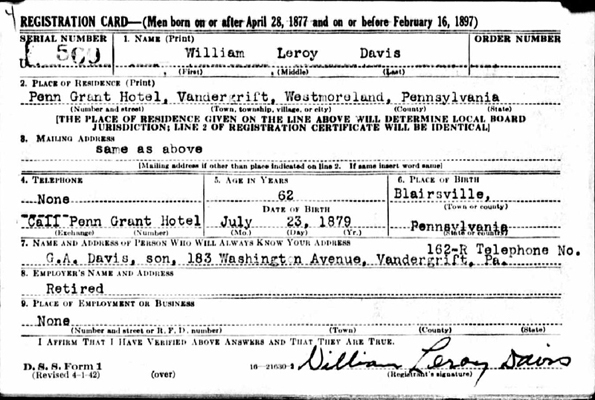 1900 U.S. Census Every-Name-Index/Images (online at Ancestry.com): William L. DAVIS (æ 20, b. Jul 1879, PA) is living in Vandergrift, Westmoreland Co., PA, with his widowed mother (q.v.) and a cousin. 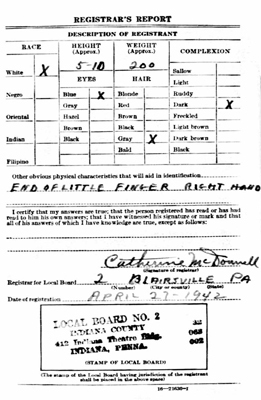 Angeline P. BEDDOWS (æ 18, b. Nov 1881, PA) is living in Apollo Borough, Armstrong Co., PA (p. 30A), with her parents, George BEDDOWS (æ 57, b. Sep 1842, England) & Elizabeth (æ 54, b. Jul 1845, England), plus an older sister. The page image was blurry and hard to read. This enumerator did a lot of unintelligible scribbling. Is this "Ab" for absent? 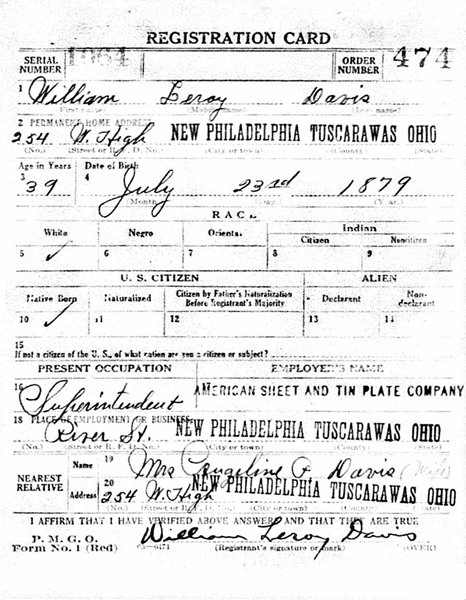 "AB" = absent; it's Tuscarawas, not Tuscawaras. 11. Public Member Trees (online at Ancestry.com).